Do you like to mix china patterns in your table settings? Or maybe you're an all-one-pattern kind of table decorator? I definitely lean toward the former - perhaps it's because I have so many colours and styles of dishes to choose from. Mixing them up allows me to get more use out of them. I like to play around with the different patterns, tying them together with a cheerful colour scheme. I also like to mix brand new dishes with vintage dishes. 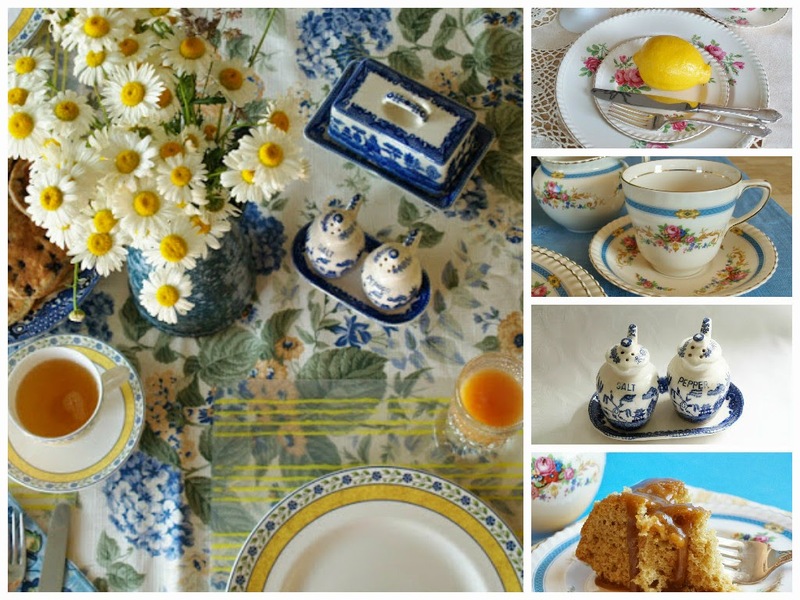 For my breakfast table setting, above left, I mixed our wedding china, Wedgwood Mistral, with various blue and white pieces I thrifted or got as gifts from my mom. I have four main china patterns - the wedding Wedgwood, Johnson Brothers' pretty pink floral pattern (above, top right), Johnson Brothers Old English (above, bottom right) and my grandmother's Midwinter Burslem Porcelon china (not pictured). Beyond that I have all kinds of odds and ends, including many blue and white plates - those are some of my favourites. So, are you a pattern mixer or a traditionalist? Hi Joann, I mix and match a lot of kitchenware, vintage and newish (is 1970 newish?). Have a great week. I am definitely a pattern mixer like you. There are too many beautiful patterns out there to pick just one. I have always favored brown transfer ware, but since moving to France I have found an appreciation for so many patterns. I usually come back to brown in the end. Thanks for sharing, you have a beautiful selection. I think mixing patterns is wonderful. I would do it if I would set a nice dinner table but it is usually just eat on the same old dishes. LOL! I had a LOT of mixed pieces but recently bought a whole set of white dishes. A HIGE set too, I'll never have to mix and match which means I'll enjoy it so much more!